Sweet Obsession Cakes & Pastries – Oh Sweet Heaven! Trafalgars Bistro at Trafalgar and West 16th has always been our favourite. It’s been our go-to place for Valentine’s Day, anniversary, birthdays and any special occasions in between. We were always impressed by the desserts, which were supplied by its sister operation, Sweet Obsession, located right next door; but it was only until recent days that we finally stopped by Sweet Obsession for some sweet treats. On two separate occasions, we tried four different desserts. 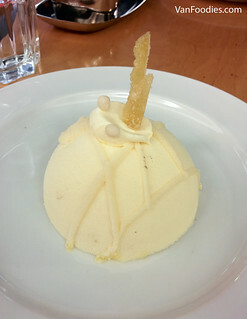 First, the Lemon Mousse Cake was creamy and had prominent lemon flavours. It had a good mousse to cake to lemon curd ratio. The lemon layers could be sourer but the flavours were well balanced. This was refreshing and very enjoyable. On the other hand, Chocolate Hazelnut Zuccotto was just decadent. It reminded me of Ferrero Roche with nutty hazelnut flavours. 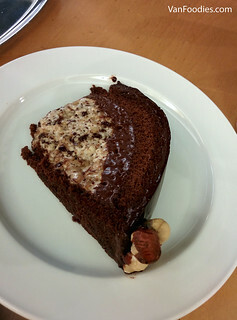 The chocolate chiffon cake was light and airy, the hazelnut layer was a bit loose, but all layers combined made it a rich and creamy cake. On the evening of a lovely Sunday, Valentine’s Day expectedly arrived at the doorstep of couples living on this side of the world. Our destination of choice was Trafalgars Bistro. Ever since our first visit there over a year ago, Trafalgars has become one of our favourites. On that special day, every customer was ordering from a four-course dinner menu priced reasonably at $45 per person (compared to $75 at some high-end restaurant downtown). Joyce: I liked how the sliced radish and carrot added a little crunchiness to the dish. Dijon vinaigrette is also one of my favourite salad dressings, along with raspberry vinaigrette. Mr.: The green salad was of garden variety, nothing too special that stood out, but there wasn’t anything negative about it either. Joyce: When eating them alone, they were a bit too salty for my liking. While the light crème fraiche might have helped balance the strong flavour, the sour, pickled leeks and apples were too over-powering. Unfortunately, I have to say, this wasn’t a very successful dish.